A kitchen renovation can be expensive, but it has the highest return on investment if you do it right. Sometimes the look you are trying to achieve can have a healthy price tag, but if you know where to save and where to splurge, you can still get the look while keeping some major coin in your pocket. 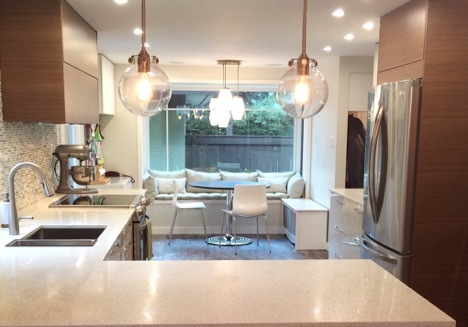 Take our client’s newly completed kitchen renovation (and let’s be honest – it was the entire back of their house). The renovation transformed their dark and cramped kitchen into a bright and expansive functional room. The owners wanted a transitional look to compliment the existing architecture and style of their house, but with a Mid-Century Modern flair. 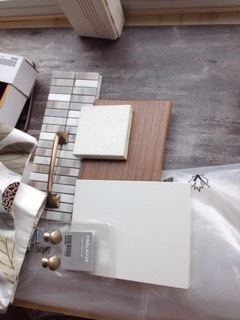 We determined the design elements required to get the “look” the clients wanted, and settled on a combination of white and walnut cabinetry, burnished bronze hardware, lighting (this was a HUGE one), and the backsplash tile. Now we had to select what elements we could save money on while still achieving the design plan. The cabinet bases were the most obvious choice from the list. This is where things get creative… the bases are Sektion from IKEA, but paired with custom doors to get the right off-white lacquer colour and walnut wood grain to suit the design. This customization is offered by a Toronto company who specializes in making doors for IKEA kitchens. Still a more cost effective plan than going completely custom. Bronze hardware can be found just about anywhere now, due to the recent rise in popularity of brassy gold metals. We chose a burnished bronze (equivalent of a satin nickel but in a gold tone) and a horizontal layout of the hardware on the white cabinets. 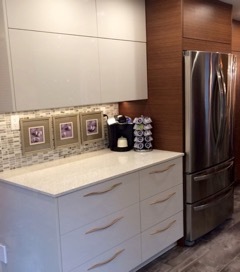 The walnut pantry section has concealed hardware, keeping the look sleek and seamless. Concealed hardware is another way to save money because decorative pulls and knobs can add up quickly and become very expensive. Be clever with your hardware – it is considered to be the “jewelry” of the kitchen. If you don’t have to buy many, then you may consider purchasing a slightly more expensive handle for a greater visual impact. Mixing and matching from suppliers is acceptable too, as long as the metals and finish are the same and the styles work together. As an example, the first knobs above are $3.99/pair at IKEA, while the one just below is $4.90/each at Lee Valley. The first pull is $8.60/ea at LeeValley and the ones just below are $6.99/pair at IKEA. If you need 30+ it can definitely add up quickly. Find the hardware you love. 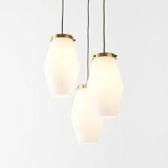 If it is pricey, then search to see if you can find something comparable for less. The lighting in this room had a huge impact. New pot lights, peninsula pendants, under-counter lighting, an eating area fixture and dining room chandelier all contribute to light up this kitchen and make it a more welcoming space. 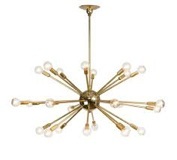 The key fixtures with the highest impact for a Mid-Century Modern look are the frosted triple-pendant from West Elm over the eating area, and the Sputnik chandelier in the dining room. The tile selected for the backsplash is a polished marble stacked mosaic, which marries the off-white lacquer with the wood and quartz counters. 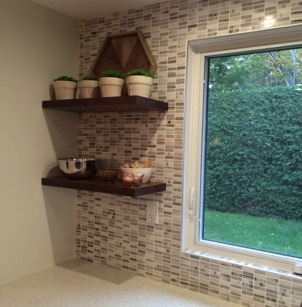 Marble gives the backsplash a timeless feel while the stacked pattern modernizes the look. The new larger window over the sink is unframed and has the tile coming right to the edge using an edge strip more commonly seen in bathroom showers. This unexpected but impactful small detail continues the seamless look of the kitchen design. As a result, the clients now have the kitchen of their dreams. It is bright, spacious, warm and inviting. Truly a space the whole family can enjoy for years to come.